The John S. Harrison House in Bexar County is one of 12 sites that Preservation Texas, Inc. has named to its tenth anniversary retrospective list of Texas’ Most Endangered Historic Places. Originally named to the 2006 list of Texas’Most Endangered Historic Places, it is designated as a saved site on the 2013 list. Preservation Texas officials announced the selections on the steps of the Texas State Capitol on Preservation Day, February 20. The annual announcement is part of Preservation Day activities organized by Preservation Texas. Advocates from all over the state come to participate in informational sessions, meet with legislators at the Capitol and get an in depth look at lessons to be learned from the sites named to the list. The one-story John S. Harrison House was built in 1852 with a detailed full porch added in 1905. The house is located on a 12-acre site along Cibolo Creek. John Harrison and his wife lived in the house for two years while John served as the first postmaster for Selma. The house is one of only two remaining original structures in Selma. 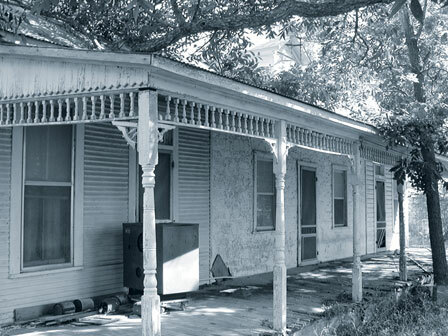 When the property received its original Texas’ Most Endangered Places designation it was owned by the City but vacant and threatened by vandalism and further deterioration. The San Antonio Conservation Society (SACS) became involved through the interests of its Farm & Ranch Committee. Acting in its role of regional preservation association, SACS supported the preservation of the property through a letter-writing campaign by its members and board, in addition to providing testimony at city council meetings. The election of a new mayor, Tom Daly, who was open to historic preservation, led to the city council approving the restoration process and financing.